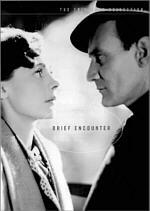 My bizarre quest to watch all ten of the 1939 Best Picture nominees on DVD continues. Unfortunately, since only eight of them currently appear in the format, I was doomed to fail before I started, but impossible odds and an illogical goal never halted me before, so why should it matter now? Love Affair actively dissatisfied me. The vast majority of the film comes across as illogical. In most romances, the principles try hard to come together, but here it seems like they attempt to find as many ways as possible to stay apart. The entire vehicle feels amazingly contrived, as though the filmmakers worked as hard as they could to keep the two lovers separate until their inevitable romantic conclusion. It didn't work for me. Most of their reasons for avoiding each other made virtually no sense, and the whole plot grew incredibly tiresome before too long. Early scenes when we see Terry McKay (Irene Dunne) and Michel Marnet (Charles Boyer) fall in love during a cruise are reasonably compelling and sweet, but once they separate, it all goes downhill from there. I won�t discuss the plot twists and turns the occur after that point - in case you want to see it and be surprised - but I found them to be unconvincing and usually overly sentimental and saccharine. Boyer and Dunne are perfectly competent in their roles, but the silliness of the story renders that point moot. By the end of the film, I could not have cared less if the two reunited. I was completely bored with their inanities by that point. What's wrong with this DVD? How much time do you have? Sharpness was completely atrocious; this was probably the softest picture I've ever seen. At no point did the image look better than "almost okay", which it achieved during a few close-ups; otherwise, it was very hazy and fuzzy. The thing was so blurry that I instinctively squinted through the whole film, which left me with a headache! Well, at least the softness meant I saw no moir� effects or jagged edges; that's as close to a compliment as I can conjure. Although contrast levels were terrible - the entire movie looked faded and washed-out - perversely, black levels often seemed semi-decent. How this happened I don't know; so much of the film was overly bright that I can't figure out how it managed some passable blacks, but they're there. Shadow detail was a non-issue because of the elevated light levels; I had no problem making out nuances in dark scenes because there were virtually no dark scenes - even those that should have been in low light were fairly bright. Chalk this one up as a total visual disaster. The monaural audio of Love Affair failed as well. First lesson if you tempt fate and watch this DVD: do not turn up the volume on your receiver to normal levels! Keep the knob very low and slowly raise the volume until you find a comfortable spot. Why the precautions? Because the geniuses at Madacy transferred this sucker at far too high a volume level; as a result, it was much louder than most films. Madacy seem to do this with many - if not all - of their DVDs; the Abbott and Costello set I also reviewed suffered from the same problem. Once you've settled in with the correct volume level, you can then deal with the second issue: whether to listen to the movie with your surround sound on or off. For the vast majority of single-channel films, this isn't an issue because the soundtrack will play back as appropriately monaural no matter what, whether through just the center channel or via the "big fat mono" method of using the right and left front speakers to create a "phantom" center image. I prefer the true mono of the first way, but both work fine. Madacy can't do anything that logically, so if you watch Affair with the surround sound "on", you'll actually get an pseudo-surround mix. That is, the same monaural track will emanate from all five channels! This was a tremendously annoying and disconcerting effect and is not recommended. � That doesn't mean the alternative's much better. If I turned off the surrounds, I got audio that came from the right and left forward speakers. No problem, right? Just another way to manage mono, correct? Wrong. The audio seemed strangely balanced and veered toward the left for the most part. At no time did it appear even remotely centered; it sounded like each speaker was slightly out of synch with the other, so the track never created that appearance audio that's localized in the correct place. I preferred this method because it seemed more sensible and it sounded slightly better than the "surround" mix, but nonetheless it was a poor option. Once I set the volume and figured out the surrounds, then I could fully experience what a miserable soundtrack Affair offered. All I ask of a 60-plus-year-old mono mix is for it to provide decently intelligible audio, but that didn't happen here. The dialogue consistently sounded edgy and distorted and it presented a strange echo effect throughout the film. As a result, I had a devil of a time understanding what the characters said. Unfortunately, no subtitles were included, so I couldn't rely on those to help. Actually, my videotape theory came into play again in regard with some of these odd sounds. If you've ever recorded over an audio tape one too many times, you may hear an old program bleeding through and interfering with the current one. 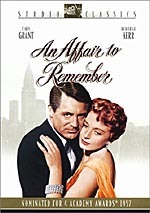 I think that's what happened here; the happy folk at Madacy were too cheap to invest in a new tape so they used the same one they utilized to make their other awful DVDs when they recorded this version of Affair from the rental they got at Blockbuster. Actually, that's probably not right. Madacy are too cheap a company to rent a tape - they probably just recorded it off of AMC on cable one night and made the DVD from that. Get the feeling I'm not too wild about the pathetic offerings that come from Madacy? After the horrible sound and picture of Affair, the supplemental features appear better, but that's all relative; they're still very weak. In the Movie Art area, we get to see what the case bills as a "lobby poster"; it looked more like a lobby card to me, but maybe I'm picking semantic nits. Another gives us a biography for Irene Dunne. Why only her? I have no idea. It's extremely brief and even manages to misspell "general" as "genereal". Finally, the interactive trivia section provides a lame game with five multiple-choice questions. Correct answers are "rewarded" with the corresponding clip from the film, while errors are punished by some light jazz and a big red "WRONG" that comes toward you on the screen. Very odd! You want to know how bad Madacy are? They can't even get the cover in the case correctly! Mine was upside-down, so that if you opened the case in the usual manner - like a book with the front cover initially facing you - the disc would be on the left of the box. Yeah, this is easily fixed, but it still seems indicative of the shoddy quality from this company. I didn't plan to view another Madacy DVD after the horrors of the Abbott and Costello set, but since I wanted to check out as many of the 1939 Best Picture nominees as possible, I had to bite the bullet here. Hopefully, this will be the last time a Madacy product enters my DVD player. 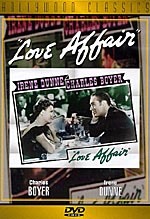 Of the eight 1939 Best Picture nominee DVDs I've watched, Love Affair offers both the worst movie and the crummiest DVD. It seemed sticky sweet and sentimental and really left me cold. The disc is a total failure. It provides an unwatchable picture, miserable sound, and almost worthless extras. Be sure to skip this clunker.